BATON ROUGE, LA—Saying that they hope to make traveling to and from football games more convenient and enjoyable, officials from the LSU athletic department announced Friday that the university will now offer a round-trip stadium shuttle bus to transport Tigers fans back to the woods. 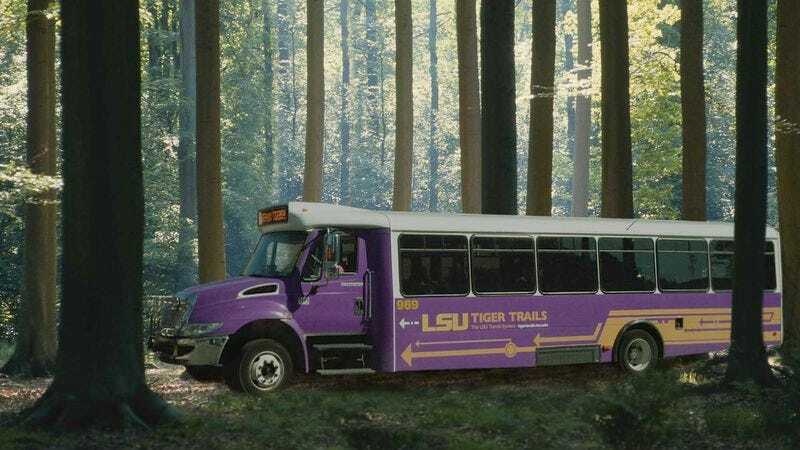 “Beginning this Saturday, for just $2 a ticket, fans can use our new Tiger Bus to ride directly from the bushlands to the game and back,” said LSU spokesman Michael Bonnette, adding that, beginning six hours before kickoff, fans can catch the bus at any of the numerous stops it will make at various ravines, forest clearings, and swamps near Baton Rouge, while return trips to the remote wilderness will begin at the start of the game’s fourth quarter. “The Tiger Bus is the perfect way to skip the hassle of the parking lot, and helps ensure that all of our fans get back to the far reaches of the forest safely. Shuttles will depart every 15 minutes in order to avoid overcrowding, though the last bus to the backwoods leaves approximately three hours after the game ends, so fans who miss that will have to find other means to return to their tents.” Bonnette added that the athletic department also plans on designating a section of the stadium parking lot for those traveling in on fanboats.